Filed to: Who doesn't need a graphics boost?Filed to: Who doesn't need a graphics boost? Who doesn't need a graphics boost? You are probably surrounded by more computers than you know what to do with, whether it’s the phone in your pocket, the old clunker at home, or the sleek little ultraportable you got from work. And while they are more than enough for everyday tasks, when it comes to real graphics prowess, I’m talking about serious gaming, 3D design, or photo/video editing, most systems don’t have the guts—or the space to accommodate the kind of silicon you’d need to push pixels around. 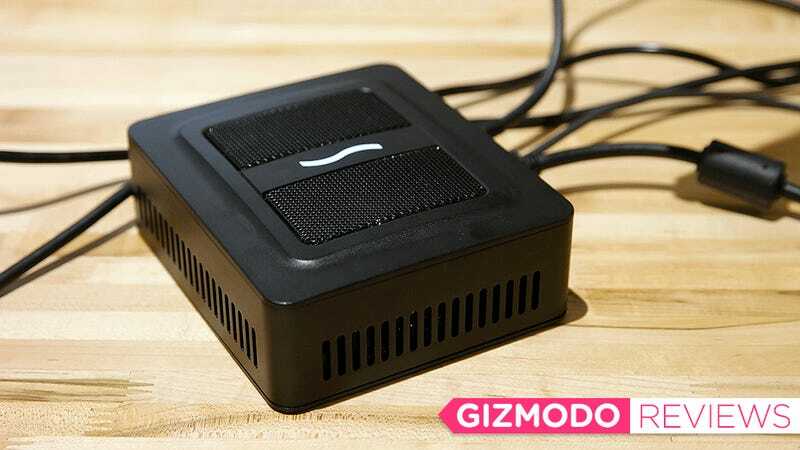 An external box that houses a GPU and connects to your computer. So as a workaround, some companies resorted to putting graphics cards in their own little boxes and then tethering them to computer using a number of different cords. Unfortunately, those solutions are usually complicated and often quite pricey. However, with the increasing availability of Thunderbolt 3, that idea of adding graphics power via an external housing got a lot less daunting. That’s because Thunderbolt 3 is a multi-purpose transfer standard that can send up to 40 gigabits per second of data and 100 watts of power through a single USB Type-C port. That’s more than enough bandwidth to push video to multiple 4K displays while still carrying enough juice to keep your notebook brimming with power. Now this doesn’t do much for phones, but almost every single flagship ultraportable laptop has at least one Thunderbolt 3 port, while Apple’s new 13- and 15-inch MacBook Pros have no fewer than two. But back to the topic at hand: external GPU enslcosures or eGPUs. Right now, mainstream choices include products like the Alienware Graphics Amplifier, Razer Core V2, or Asus ROG XG Station 2. But Alienware’s graphic amp uses a proprietary cable that only works with other Alienware notebooks, while the Razer Core and Asus XG Station 2 cost $500 or more just for the box, which means you’re going to have to shell out at least another $150 or so for a GPU worth putting inside. But if you dig a little deeper, there are smaller manufacturers like Sonnet that have been crafting eGPUs for years, but without the hype you get from bigger computer brands. 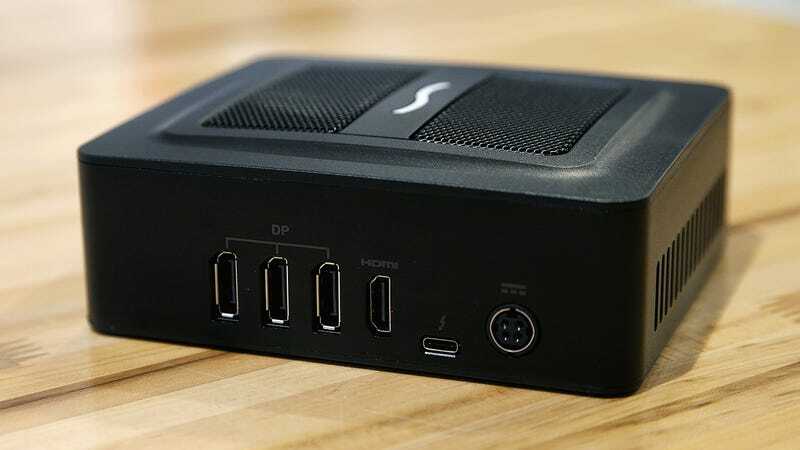 And just last week, Sonnet released a more affordable external graphics box starting at $450 with an AMD RX 560 GPU or $600 with a RX 570. Now I know what you’re thinking: These things still aren’t that cheap, and you’re not wrong. But for a single package that can completely change the performance of your system, at least we’re moving in the right direction. This is everything that comes included with Sonnet’s Breakway Puck, aside from the WESA mount. Setup is relatively simple too. All you have to is plug in the eGPU using the included short, but still serviceable 1-foot USB-C cord. From there, PCs running Windows 10 should automatically detect Sonnet’s Breakaway Puck so just select the option enabling the device, while also choosing the “always connect” setting to ensure your system won’t revert to onboard graphics in case you turn off your machine or it goes to sleep. Finally, download the graphics drivers for the eGPU you are using (which in our case was the AMD RX 560 model), and then restart your computer when it’s done installing. You can then either choose to hook up an external monitor using one of the three DisplayPorts or the lone HDMI connection on the back of the puck, or stick with the display built-into your laptop or all-in-one. As a bonus, Sonnet even includes a standard VESA mounting bracket, so people can hide the Puck behind a freestanding display. You can opt to use the display one your laptop if you want, but the real benefit is being able to send quality graphics to a big screen. Once you got your battle station setup just the way you want, go ahead and fire up your games. In our tests, the numbers speak for themselves. 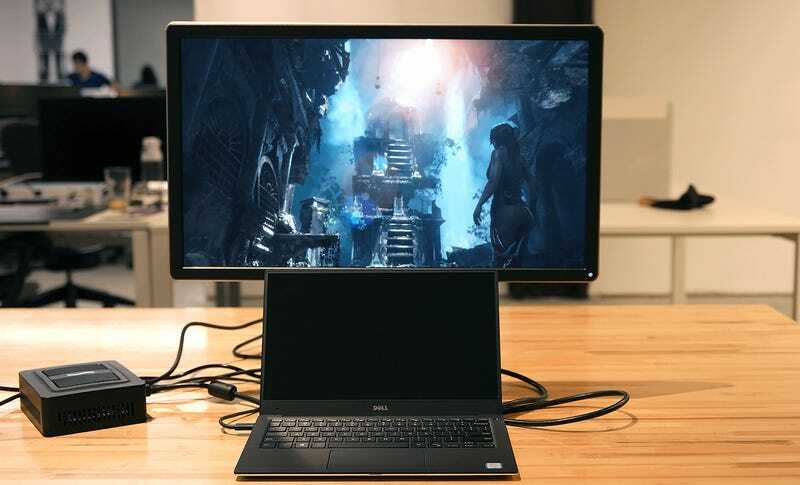 On a brand new Dell XPS 13 with an 8th-gen Intel Core i7 CPU and 8GB of RAM (but weak integrated graphics), Sonnet’s graphics puck boosted frame rates in both Rise of the Tomb Raider and Civilization 6 from unplayable slideshow territory and transformed it into a legit gaming machine. And it was the same story for a ThinkPad T470. Even though it had an Nvidia 940m GPU and 16GB of RAM, it still couldn’t get anywhere close to 30 fps without help. The only real hassle I ran into was that Civ 6 didn’t automatically detect the eGPU, which meant I had to fiddle with the graphics settings and relaunch the game several times until it did. Rise on the Tomb Raider, on the other hand, had no trouble recognizing the eGPU, so it seems like ease of use will vary from game to game. I should also mention that while setting up the XPS 13, I got several system alerts saying that the eGPU might not work properly, but aside from one crash while installing the AMD graphics drivers, I didn’t run into any more complications. The lone USB-C ports connects to the Thunderbolt 3 port on your computer, All the other ports are for external displays. That said, there are still some things I wish Sonnet’s eGPU did a bit better. Since you already have to plug the Puck into your computer, it would be nice if Sonnet had included some additional USB ports. 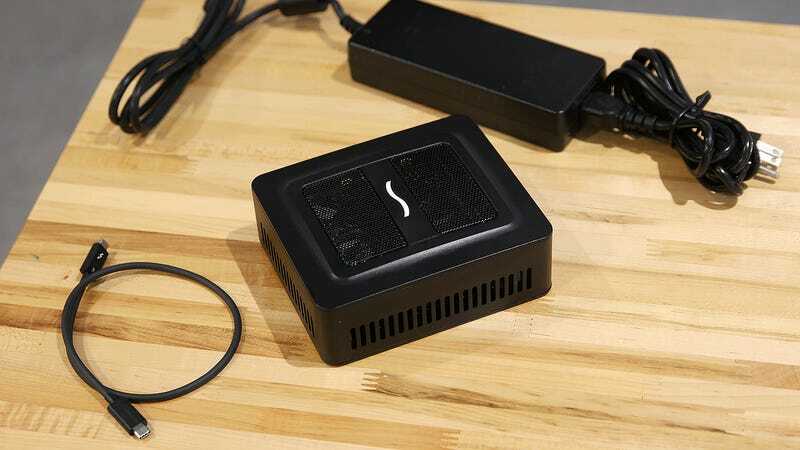 The eGPU already sends up to 60 watts of power via Thunderbolt 3, which is enough to power most small and mid-sized laptops, and it would be nice if you could connect a mouse and keyboard too and use the Puck as a dock too. I also found the the Puck’s fan noise a bit distracting at times. When it spins up, you’re definitely going to notice (unless you’re wearing headphones), and because the included USB-C cord is so short, it’s not like you can stash the Puck somewhere more out of the way. But perhaps the real takeaway is that despite being generally easy to use and offering a significant boost in graphics performance, even Sonnet’s most affordable eGPUs still doesn’t feel that cheap. You can buy a regular AMD RX 560 GPU with 4GB of vRAM for around $130 or less, which means that the box the puck comes is costs about $300, twice the price of the GPU that’s inside. Still, the kind of bump in performance Sonnet’s Puck provides is sweet, if a bit niche. It could revive an aging all-in-one or turn your boring work computer into something that can play real games on nights and weekends too. And based on the numbers we got, it seems like those CPUs still had even more to give, which might work better with one Sonnet’s more capable GPU enclosures. But like products from Razer, Asus, and others, that extra performance doesn’t come cheap. Requires a Windows 10 PC with a Thunderbolt 3 port. Mac support requires High Sierra and is still a work in progress. Not all Macs with Thunderbolt work with AMD’s beta drivers yet either. The GPU enclosure features three DisplayPorts and one HDMI connection, but no additional USB ports. You must connect the eGPU and install graphics drivers before you can connect external displays. Games may require some tweaking too before recognizing the eGPU. Comes with either an AMD RX 560 for $450 or RX 570 GPU for $600.